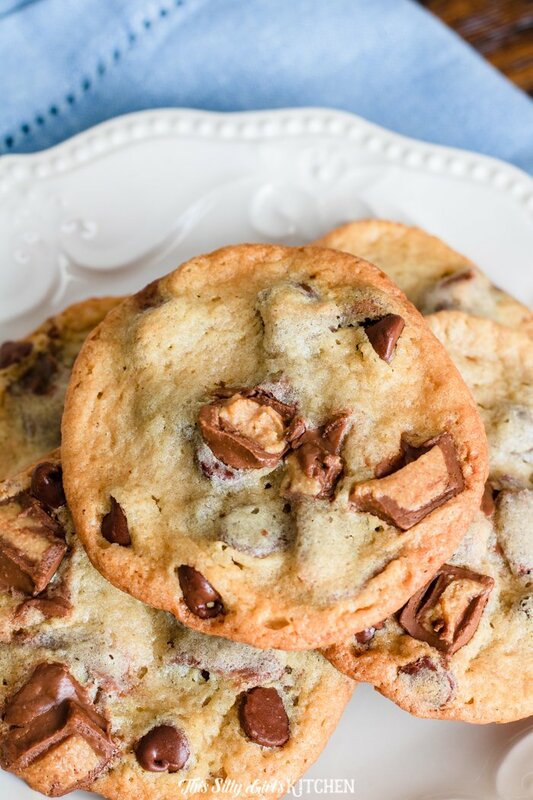 Reese’s Peanut Butter Cup Cookies are like classic chocolate chip cookies on steroids. Loaded with both chocolate chips and mini resse cups, you can’t go wrong with these Reese’s Peanut Butter Cup Cookies! 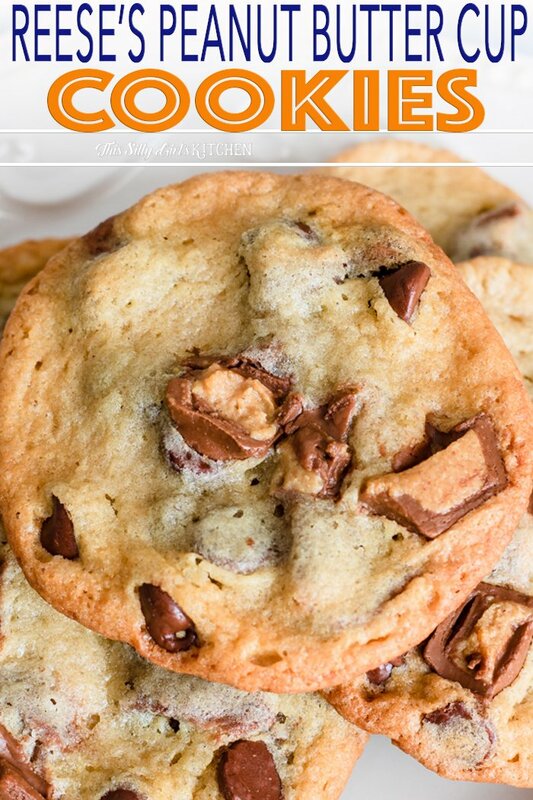 Reese’s Peanut Butter Cup Cookies – one epic cookie! 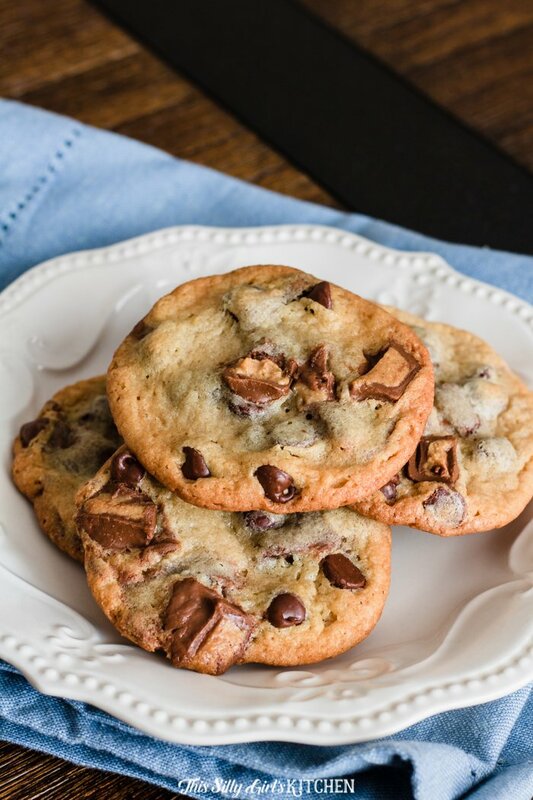 When I think of home baked cookies, I often think about the delicious taste of moist chocolate chip cookies. While chocolate chip cookies are delightful, cookies with peanut butter cups tend to delight my senses a bit deeper. It is my favorite candy after all! One of my favorite candy options is Rees’s Peanut Butter Cups, so I figured why not create a recipe for reese peanut butter cup cookies?! 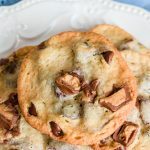 You’ll be pleasantly surprised at how tasty these cookies with peanut butter cups taste and will soon be whipping this recipe up as a large batch to freeze for future enjoyment. 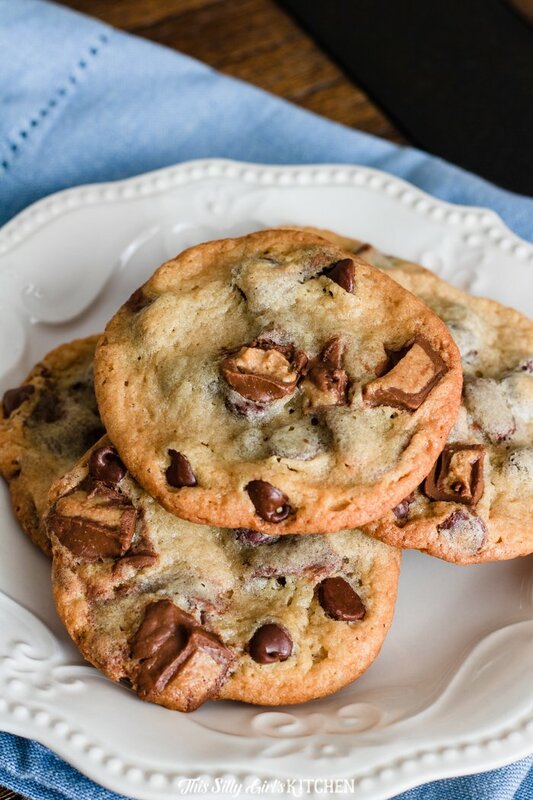 You’ll be surprised at how delicious, like seriously – beyond chocolate chip deliciousness. 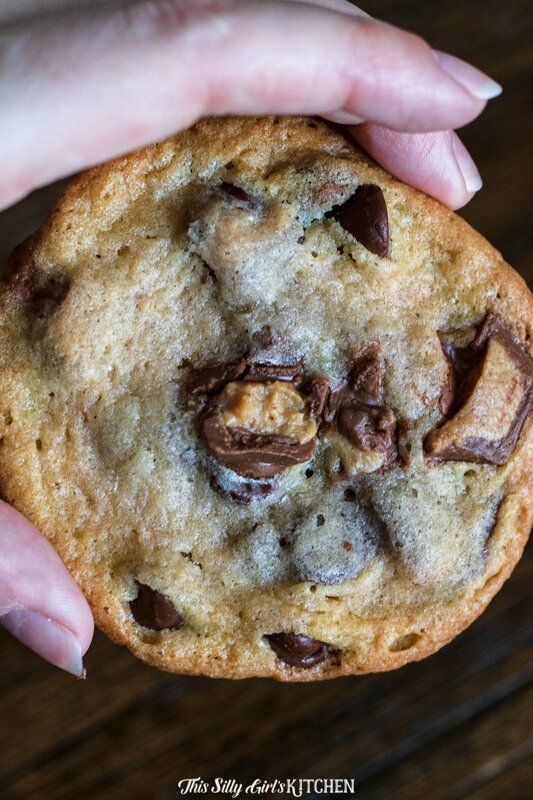 These cookies with peanut butter cups are what sweet dreams are made of. Take my word for it, these cookies with peanut butter cups are beyond magical. They are melt in your mouth deliciousness combined with the perfect texture to satisfy your sweet tooth. 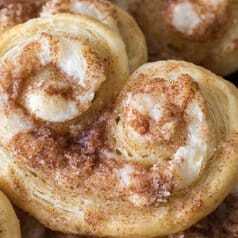 Make my Cinnamon Cream Cheese Cookies next! Your first step is to create a basic chocolate chip cookie batter by creaming together softened butter, granulated sugar, and brown sugar. You can use a hand mixer or stand mixer for this process. I’m pretty lazy so I tend to use the hand mixer, I don’t feel like lugging out the big boy for cookie dough often. Next, you’ll mix in the eggs and vanilla until combined. Add in the dry ingredients. Fold in chocolate chips and chopped up mini Reese cups. Be sure to let the cookies with peanut butter cups dough chill in the fridge for at least an hour. 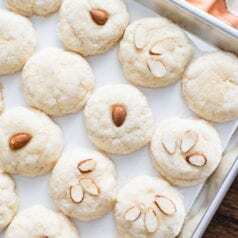 Drop tablespoon size spoonfuls onto a cookie sheet and bake for 9 minutes at 375 degrees. To make them a little more pretty when they come out of the oven, I like to place a couple chopped up reese cups and a few chocoalte chips right on top of the dough balls before baking. While the cookies with peanut butter cups may not look done, they’ll be completely ready once cooled. After the cookies have cooled (if you can wait that long! ), feel free to enjoy them. Obsessed with cookies and peanut butter cups like me?! You HAVE to try these Chocolate Peanut Butter Cookie Sandwiches! Can you freeze Reese peanut butter cup cookies? Now that you’ve enjoyed reading a bit more about cookies with peanut butter cups, I’m sure you want to know how to freeze these homemade cookies. This is the perfect way to store your reese peanut butter cookies for later enjoyment. When you’ve made a large batch of homemade cookies with peanut butter cups, you can freeze them to keep them fresh longer. 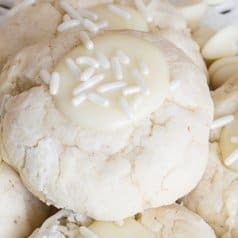 How to freeze baked cookies? In order to freeze homemade cookies with peanut butter cups, you must place them all individually on a baking sheet to cool. Put the baking sheet with cooled down cookies in your freezer for as long as it takes to freeze the cookies with peanut butter cups solid. Once your reese peanut butter cup cookies have frozen solid on the baking sheet, they can be transferred to a plastic bag or another airtight container. You can keep homemade cookies in the freezer until you’re ready to dig into these sweets at a later time. Baked cookies will last in the freezer for up to three months according to Better Homes & Gardens. To enjoy frozen homemade cookies at a later date, simply take them out of the freezer and allow them to get to room temperature. If you want them slightly warmed, from there you’ll reheat the cookies in the oven at 275°F for about 5 minutes. Peanut Butter Oreo Buckeyes should be next on your baking list! Alternatively, you can even freeze the reese’s peanut butter cup cookies dough before baking. This is a wonderful option for a make-ahead treat. Kind of like meal prepping… you can cookie prep too! To freeze cookie dough, just make the dough. Then, roll out the cookie dough balls into portions like you would do just before baking. Place them on a sheet tray, not touching, and pop the whole thing into the freezer. Freeze until frozen solid, about three hours. From here, you can layer them into an air-tight container with parchment paper in-between. OR, you can just pop all the dough balls into a ziplock freezer safe baggie and throw it in the freezer. I love to put the directions on how to bake the cookies on the outside of the bag or container, so I can make a cookie or two any time I have a craving. This method of freezing cookie dough works for most cookie dough recipes. The only kinds of cookies this won’t work for are very loose doughs that you can’t roll into a ball like meringues or lady fingers. Reese's Peanut Butter Cup Cookies are like classic chocolate chip cookies on steroids. In a medium-sized bowl, add the flour, baking powder, salt, and the baking soda. Whisk to combine, set aside. Do not preheat the oven yet, the dough will need to chill. In a large bowl, cream together the butter, the granulated sugar, and the brown sugar until the mixture is creamy. You can do this with a hand or stand mixer. Add in the eggs and the vanilla, mix to combine. Slowly add the dry ingredients a little at a time into the wet ingredients, until it's fully mixed. Fold in the chocolate chips and 1 1/2 cups of the Reese cups into the dough. Place bowl in the fridge, covered with plastic wrap for one hour to chill. Do not skip this step! While chilling, preheat oven to 375°F. Dollop 1 tablespoon-sized dough balls onto a parchment lined baking sheet, about 4 inches apart. Roll into balls. Take the remaining cut-up peanut butter cups and add one on top of each piece of cookie dough for presentation. You can also add a few chocolate chips as well. Bake for 9-10 minutes but do not overbake. Cookies will look slightly underbaked in the center. Let cool on the sheet tray for 5 minutes, transfer to a wired rack to cool the cookies completely.